Whether you’re out riding your All Terrain Vehicle, your snowmobile or another recreational vehicle you want to be confident that you’re covered when you’re out riding. 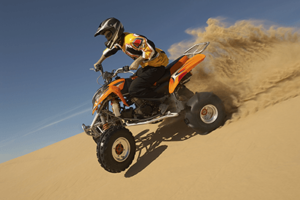 Without a great ATV Insurance policy or Recreational Vehicle Insurance policy, chances are you are leaving a lot to risk. At Secure Insurance Solutions we can make sure that you have Four Wheeler Insurance designed for you. It’s important to have the right coverage. We’ll make sure it covers both your vehicle and give you enhanced medical coverage for any accidents. You may think your ATV or snowmobile is covered by your homeowners insurance policy. But, what if you’re away from home? Generally your homeowner’s policy doesn’t protect your power vehicle from theft and fire when it’s not at your home. This is coverage only available with specific Quad Insurance or Recreational Vehicle Insurance. You might be thinking it’s too expensive for specialized insurance for your recreational vehicles. But it is surprisingly inexpensive to cover your vehicle and protect yourself. And if you drive your quad on public roads, it’s now mandatory that you carry Quad Insurance. You don’t want to take another trip without the peace of mind knowing that your vehicle is protected against theft and that you have the medical care you need with your Four Wheeler Insurance. Click on our Get a Quote button and we’ll get back to you with a surprisingly affordable quote for your Recreational Vehicle Insurance policy.